We believe in the openess and accessibility of software and the Internet of Things. We favor a model driven representation of the physical world. This universal thing model includes the semantic description of things with flexible components, capabilities (properties, actions) as well as modular context information (value, unit of measure, security classes, technology specifics, groupings, ...). We enable a technology agnostic machine-to-machine interaction AND its understandable for human beings. Things are represented in a flexible world of units. Units could be groups of things or homes, buildings, streets, cities, vehicles, grids etc. or all kind of subareas instantiated in a container. 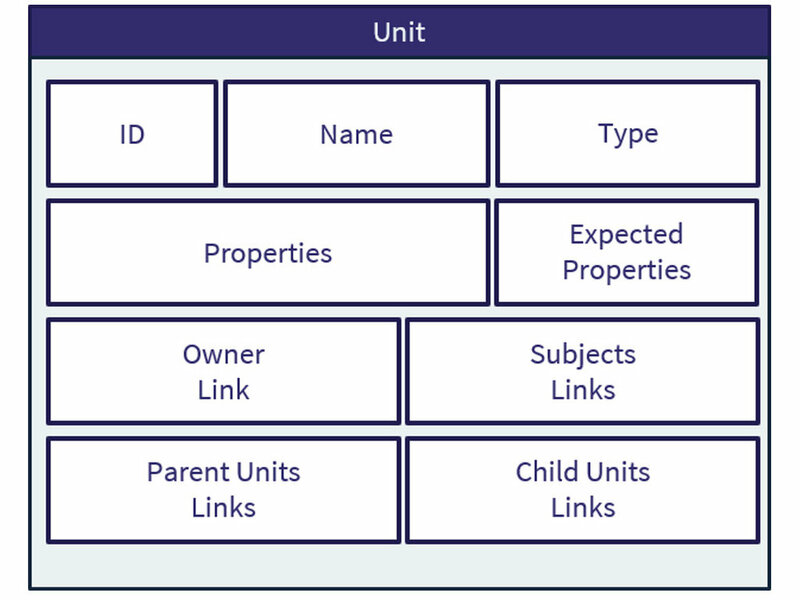 Using things and units, you need to configurer permissions. connctd's user management is based on a secure authentication process (OAuth2) and state-of-the-art principles to generate access tokens. At the same time, we focus on privacy-by-design. The connctd service creations platform supports data exchange to different clouds and it is completey scalable and & interoperable. We are convinced that everybody should be able to create truly valuable services that increases the quality of life and make technology accessable for a broader audience. For that, we develop and run the efficient scalable and open service creation IoT-platform including across different technology standards and any connected hardware could be used on a modular principle. In addition, different user and role concepts can be set. RESTful API - Our services offer easy to understand and meaningful RESTful APIs. Thing abstraction - Fed up with changing, stubborn and proprietary APIs? Benefit from our thing abstraction. Events - Register callback URLs in order to get updates from things or units. Secure communication - In the field of IoT, security is often a neglected topic - but not for us. Our services only accept communication via HTTPS/TLS and we will add much more features in cooperation with manufacurers. Reliability & Scalability - We have chosen the Google Cloud Platform as our service provider in order to get the best performance. Our services are developed in such a way that our cluster can automatically adjust its size by spawning or removing service instances depending on the actual demand. We will widen the platform by bracing on different platforms, e.g. Azure or AWS. Make use of pre-existing connectors - Make use of our connector service which already gives you access to a couple of existing third party integrations. Simulation - Boost your development by simulating things instead of using real devices. Since third party domain entities are translated based on our thing abstraction a virtual e.g. lamp will look the same like for example a LIFX Lamp. Device Management - one of the most important features will be added soon, e.g. to support over the air updates. Further information click for docs or a tutorial. We don't want any information about your users nor do they have to be registered on our platform. Whenever you send a request to our platform which is related to one of your app users, the request just needs to possess a user id within the header. This id is generated by YOUR app and can be absolutely random. Functions give you the possibility to aggregate and reason about data and to derive for example actions or new virtual things from the results. This makes it easier for you to implement your use cases as the required information is already in a well known place and format. We are currently working on opening the functions API to all developers. 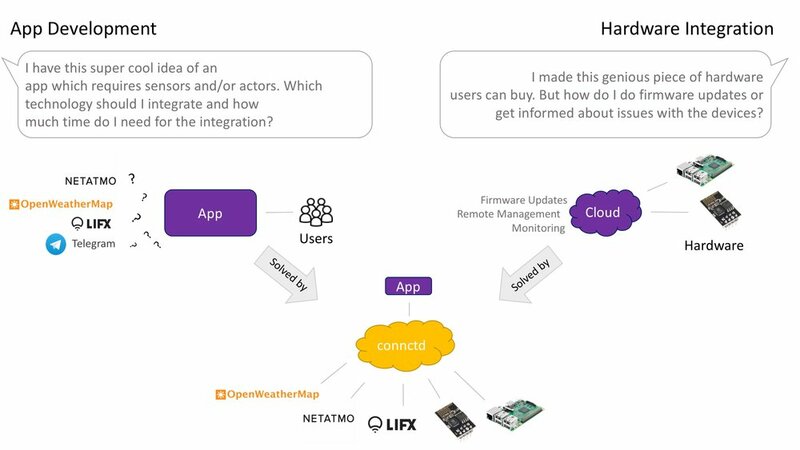 developers aren't forced to handle every detail of IoT hardware anymore and can focus on the meaning and context of gathered data. Coming soon: We offer various SDKs in order to hook up custom devices to our platform. Our device management will include features like OTA firmware updates, device monitoring, remote device management and device onboarding. The first IoT playground on our website. We will add some more stuff and tools to works with soon just to demonstrate the principles of our thing abstraction. Even more for testing innovative technolgies, different devices, systems, services and the connctd service creation IoT platform. A selection of well-known software tools we use for our daily work. We search for helpful (open source) tools every day and we contribute to make these tools even better. We provide all available functions of a device in an intelligible form via our API. For your own use of our service creation IoT platform, for developers or for those who would like to integrate their technologies and services, … of course, we support this. For further information click here for docs or a tutorial. How we think about developers. Remember breathless Steve and his fantastic show.